If I am interested, what happens next? Pump houses can be a source of many health hazards. These buildings are a breeding ground for mice and other rodents that can be a potential health hazard for any one coming into contact with their droppings and dust. Hantavirus is a serious health concern for all owners and pump technicians. Electrical wiring should be maintained as well, loose wires can have insulation rubbed or chewed off leaving exposed wiring. This becomes a very dangerous condition when working around wet conditions. Pump house safety is often over looked as regular maintenance but should be a part of a yearly program. Our design team has the knowledge, technology, and tools to design the water well system required to meet your needs. We design systems from the most basic water well to very sophisticated industrial installations. Our new style "frost free" pump house has changed the maintenance needs of many well owners by eliminating the need for heat in the winter months. This more efficient installation saves money each winter and relieves stress on the plumbing as well as the owner not having to worry about frozen pipes and power outages. Because we are licensed plumbers you can have the same person install your well pump, controls, expansion tanks, and service lines without having to deal with different contractors. This eliminates confusion and ensures the system is installed correctly the first time while allowing the owner to deal with one company if any warranty issues arise. Constant pressure or CP units have evolved with technology to become a very dependable and desirable option in residential settings. These systems eliminate the need for the traditional expansion tank and provide a more constant pressure to the faucet than does the traditional well system. Ask us about the new CP technology and we will help you determine which system will work best for your needs. We also perform test pumping to determine the total output of wells as all wells are limited to the total GPM (gallons per minute) output they can provide. This service is usually needed in larger production wells such as irrigation and industrial wells, but in some cases is needed in residential situations to determine the size of pump to be used in the well. Industrial - We have experience in industrial pumps, piping and plumbing. Our teams have designed and installed many types of pumping situations from sewage lift stations and industrial waste water disposal systems to common centrifugal pumps to boost water pressure. 4-D Plumbing has experience installing systems for companies such as; Micron Technologies, UDOT, Best Western Motels, Juab School District, Nephi City Corp. & Moroni Processing Plant. 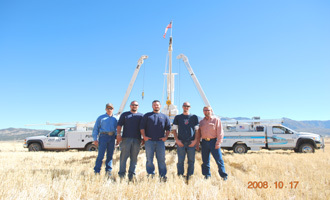 We have good working relationships with several engineering groups who specialize in the water well and pump industry. Let our team of professionals assist you in any phase of design or construction to help make your project a complete success. Agriculture - Our company has over 50 years working with the agricultural industry, from irrigated crops to pumping waste. We have livestock and crops of our own and understand the challenges associated with this volatile industry. Time is critical when the water stops flowing to a herd of livestock, or crops during the growing season. We pride ourselves in rapid response and repair. We also perform a full range of services from installation of water wells, pumping systems, pump replacement/repair, booster pumps, electrical wiring, abandonment, sanitation and generator needs to name a few. We have the capability to design a complete system from the planning phase to finished piping. We can refurbish and bring old wells back to life with modern techniques that range from brush & swab to chemical analysis and chemical restoration. With the help of Design Technologies expert team and unique products, many large wells can be brought back to original GPM production with the correct treatment. We can replace seals, check your electrical problems and repair all of your pump control panel needs. No pump is too small or too large for us to assist you with, we have served Utah's farmers for two generations and take pride in working in this field. Residential - We have the expertise to assist you in all aspects of your water well and water delivery system. Our team of licensed plumbers and factory trained pump installers use the most modern technology available to design and install the components needed to complete the most efficient system available today. We will recommend a system that fits your individual needs to meet the maximum efficiency possible. Our pump systems are designed using factory specifications and matching components to assure maximum results. We have installed pump systems at standard residential sites, on flowing springs, at hunting cabins and pumps that provide thousands of gallons a day for subdivisions with great results. Our pump installers combined with our plumbing experience provides you with exceptional options to assure you get the results you desire. We pride our selves in designing a system that will work at maximum efficiency, saving you money, and providing you with the results you expect from a quality system for a fair price. We will spend the quality time needed to have your system working at optimum efficiency for your peace of mind and trouble free operation. Many of the older water well systems we look at have expansion tanks that do not have liners or are too small for the pump system they are servicing. Many older systems were installed before there was a concern about efficiency, and pumping costs were minimal compared to today. Also with the drought being a factor in water levels dropping, some pumps can not handle the added pumping height and do not meet the needs of the owner. With a quick visual check and maybe a head pressure check on your pump we could make any recommendations that we feel would make your system more efficient and cost effective. Our design team will explain the benefits to you or tell you if your system is sufficient for your needs at today's standards. If you have any doubts about your system, give us a call for a visit and consultation. Water Well abandonment is usually required by law any time a well is replaced or relocated. We have the equipment to install the grout seal and provide the abandonment log to the State office. To read the requirements and State Statute you can check out the link at the top of this page under "DID YOU KNOW". Well Proofing is done in accordance with all state regulations and requirements. We use modern GPS equipment for location and mapping purposes. Our certified engineering partners allow us to process this information in a timely and professional manner. If this is a service you are in need of, please call our office for details. Static Level = The distance from ground level to the water level in the well in a natural state or when not pumping any water. Draw Down = The distance from ground level to the water level in the well while the pump is running. This can be quite different from static level in some cases, and this level determines the lift that the pump needs to be able to produce to get water to ground level and build the desired pressure on the surface. Casing = This is the pipe installed by the driller to keep a hole in the ground and also used to install the equipment in the well to bring the water to the surface. Perforations or Screen = This is a term for holes made in the casing to allow water to enter the well. There are several ways these are made and vary from simple torching to very elaborate stainless steel screens installed at the time the casing is installed. Column = The pipe going from the surface down the well that conducts the water from the pump to the surface. Well Seal = This is a device installed on the casing at the surface to protect the well from anything entering the casing, such as animals, dirt, etc. These are important to keep wells sanitary. Pressure Switch = Is a device used to turn a pump on and off automatically. This determines how much pressure a system has and can be adjusted or changed by pump service technicians. Expansion Tank = This is a tank with air inside to give an air cushion to the pump system. These are needed in a conventional well to prevent on/off cycling of the pump. C.P. = Constant pressure units consist of a solid state controller and a submersible pump. These units change the speed of the pump to meet the demand while maintaining a constant pressure. Test Pump = This is a procedure to determine how much a particular well will produce, usually consisting of step & constant rate pumping for an extended period of time over several days. ABANDONED WELL - any well which is not in use and has been filled or plugged so that it is rendered unproductive and will prevent contamination of groundwater. A properly abandoned well will not produce water nor serve as a channel for movement of water from the well or between water bearing zones. ANNULAR SPACE - the space between the inner well casing and the outer well casing or borehole. AQUIFER - a porous underground formation yielding with drawable water. ARTESIAN AQUIFER - a water-bearing formation which contains underground water under sufficient pressure to rise above the zone of saturation. ARTESIAN WELL - a well where the water level rises appreciably above the zone of saturation. BENTONITE - a highly plastic, highly absorbent, colloidal swelling clay composed largely of mineral sodium montmorillonite. Bentonite is commercially available in powdered, granular, pellet, or chip form which is hydrated with potable water and used for a variety of purposes including the stabilization of borehole walls during drilling, the control of potential or existing high fluid pressures encountered during drilling below a water table, well abandonment, and to provide a seal in the annular space between the well casing and borehole wall. BENTONITE GROUT - a mixture of bentonite and potable water specifically designed to seal and plug wells and boreholes mixed at manufacturer's specifications to a grout consistency which can be pumped through a pipe directly into the annular space of a well or used for abandonment. Its primary purpose is to seal the borehole or well in order to prevent the subsurface migration or communication of fluids. CASING - a tubular retaining and sealing structure that is installed in the borehole to maintain the well opening. CATHODIC PROTECTION WELL - a well constructed for the purpose of installing deep anodes to minimize or prevent electrolytic corrosive action of metallic structures installed below ground surface, such as pipelines, transmission lines, well casings, storage tanks, or pilings. CONSOLIDATED FORMATION - bedrock consisting of sedimentary, igneous, or metamorphic rock (e.g, shale, sandstone, limestone, quartzite, conglomerate, basalt, granite, tuff, etc.). DISINFECTION - or disinfecting is the use of chlorine or other disinfecting agent or process approved by the state engineer, in sufficient concentration and contact time adequate to inactivate coliform or other organisms. DRAWDOWN - the difference in elevation between the static and pumping water levels. DRILL RIG - any power-driven percussion, rotary, boring, coring, digging, jetting, or augering machine used in the construction of a well or borehole. GRAVEL PACKED WELL - a well in which filter material is placed in the annular space to increase the effective diameter of the well and to prevent fine-grained sediments from entering the well. GROUNDWATER - subsurface water in a zone of saturation. GROUT - a fluid mixture of Portland cement or bentonite with water of a consistency that can be forced through a pipe and placed as required. Various additives, of sand, bentonite, and hydrated lime, may be included in the mixture to meet different requirements. HYDRAULIC FRACTURING - the process whereby water or other fluid is pumped under high pressure into a well to fracture and clean-out the reservoir rock surrounding the well bore thus increasing the flow to the well. MONITOR WELL - a well as defined in Subsection R655-4-2(2.8) that is constructed for the purpose of determining water levels, monitoring chemical, bacteriological, radiological, or other physical properties of ground water or vadose zone water. PITLESS ADAPTER OR UNIT - an assembly of parts designed for attachment to a well casing which allows buried pump discharge from the well and allows access to the interior of the well casing for installation or removal of the pump or pump appurtenances, while preventing contaminants from entering the well. Such devices protect the water and distribution lines from temperature extremes, permit termination of the casing above ground as required in Subsection R655- 4-8(8.2) and allow access to the well, pump or system components within the well without exterior excavation or disruption of surrounding earth. POLLUTION - the alteration of the physical, thermal, chemical, or biological quality of, or the contamination of, any water that renders the water harmful, detrimental, or injurious to humans, animals, vegetation, or property, or to public health , safety, or welfare, or impairs the usefulness or the public enjoyment of the water for any or reasonable purpose. POTABLE WATER - water supplied for human consumption, sanitary use, or for the preparation of food or pharmaceutical products which is free from biological, chemical, physical, and radiological impurities. PRESSURE GROUTING - a process by which grout is confined within the drillhole or casing by the use of retaining plugs in packers and by which sufficient pressure is applied to drive the grout slurry into the annular space or zone to be grouted. PRIVATE WATER PRODUCTION WELL - a privately owned well constructed to supply water for any purpose which has been approved by the state engineer (such as irrigation, stockwater, domestic, etc.). PROVISIONAL WELL - authorization granted by the state engineer to drill under a pending, unapproved water right or exchange; or for the purpose of determining characteristics of an aquifer, or the existence of a useable groundwater source. PUBLIC WATER SYSTEM SUPPLY WELL - a well, either publicly or privately owned, providing water for human consumption and other domestic uses which has at least 15 service connections or regularly serves an average of at least 25 individuals daily for at least 60 days out of the year. PUMPING LEVEL - the elevation of the surface of the water in a well after a period of pumping at a given rate. SAND CEMENT GROUT - a grout consisting of equal parts of cement conforming to ASTM standard C150 and sand/aggregate with no more than six (6) gallons of water per 94 pound sack (one cubic foot) of cement. STATIC LEVEL - stabilized water level in a nonpumped well beyond the area of influence of any pumping well. UNCONSOLIDATED FORMATION - loose, soft, incoherent rock material composed of sedimentary, igneous, or metamorphic rock which includes sand, gravel, and mixtures of sand and gravel. These formations are widely distributed and can possess good storage and water transmissivity characteristics. VADOSE ZONE - the zone containing water under less than atmospheric pressure, including soil water, intermediate vadose water and capillary water. The zone extends from land surface to the zone of saturation or water table. WELL - a horizontal or vertical excavation or opening into the ground made by digging, boring, drilling, jetting, augering, or driving or any other artificial method for utilizing or monitoring underground waters. 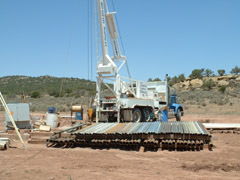 WELL DRILLER - any person who is licensed by the state engineer to construct water wells for compensation or otherwise. The licensed driller has total responsibility for the construction work in progress at the well drilling site. WELL DRILLING - the act of constructing, repairing, renovating, or deepening a well, including all incidental work.